At Vive we absolutely adore Kombucha! Not only is it super refreshing (especially this time of year) & delicious but its contains a wide variety of gut loving bacteria & enzymes which assist in the maintenance of a healthy digestive tract. 1 cup starter liquid from previous batch or store bought plain un-flavoured Kombucha – Buchi Mama works perfectly! Method – Let the Fermentation Begin! In a large pot on the stove add 3 litres of water & sugar, simmer until the sugar has dissolved completely. Take off the heat & add the tea bags & allow to brew for 30-60 minutes (depending on how strong you like your kombucha). Remove tea bags from liquid & allow to cool to room temperature. Do not add hot liquid into jar with SCOBY, this will destroy some of the beneficial properties! Add cooled liquid into a sterilized glass jar with SCOBY & starter liquid. Cover with the muslin cloth & secure with rubber band or string. Leave in a warm dry area away from direct sunlight (in the pantry is perfect). Leave for a minimum of 7 – 10 days (try not to disturb during this time as this may introduce some unwanted bacteria into your wonderful brew). You’ll notice during this initial week another small SCOBY will begin to form, this is completely normal. At the 7 day mark you can begin to start tasting, it should start to develop a tart/sour vinegar-like flavour. This occurs as the SCOBY eats the sugar. When the sour flavour is well-developed or too your liking your kombucha is ready to go. Strain out 3/4 of the liquid, leaving approx. 1/4 for the next batch. And start again from step 1 to continue brewing. At this stage you can also separate your new SCOBY & pass along to another amazing person wanting to also brew there own gut loving kombucha. 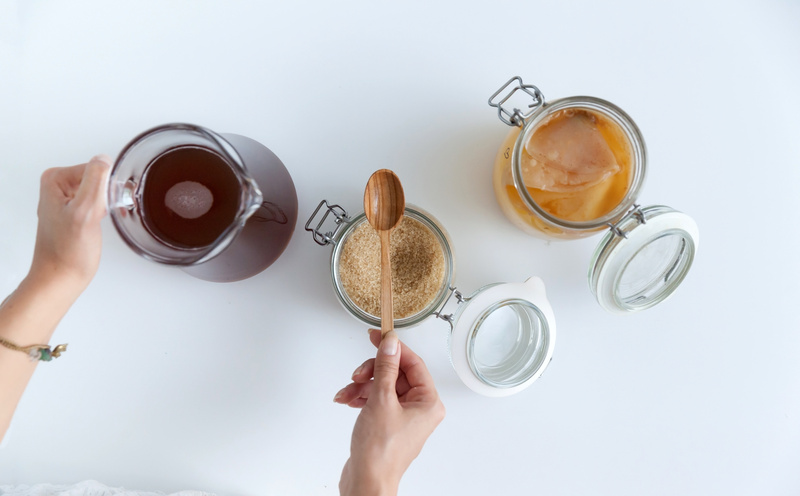 **A quick note about SUGAR | Don’t be scared of the sugar there actually shouldn’t be any sugar left after fermentation. The sugar is in fact an essential fuel for the SCOBY in order for it to produce all those amazing bacteria & enzyme kombucha is known for. You can not brew good quality kombucha without sugar. ** Filtered Water must be used for brewing kombucha. Unfortunately tap water due to its chlorine content doesn’t allow the fermentation process to take place as effectively. This is due to it’s natural anti-microbial activity. For kombucha we want the healthy microbes to grow NOT to kill them off. Can’t be bother to make your own. That’s fine too. You can fill up any 500mL or 1L bottle at our Kombucha refill station here in store! This entry was posted in Health Recipes, Health Supplements, Organic Food, organic recipes, Spring, Vive Clinic, Vive Health Nutrition, Well-being and tagged balanced gut microbiome, brew your own kombucha, brisbane naturopath, brisbane nutritionist, bulimba naturopath, bulimba nutrition, fermented foods, fermented foods to improve gut health, food is medicine, gut health, gut microbiome, hawthorne naturopath, hawthorne nutrition, healthy gut bacteria, healthy recipes, how to make kombucha, kombucha, microbiome, probiotics, vive health, vive health nutrition. Bookmark the permalink.